This week, I've been living in a wonderful world of food. Specifically, the world right in between the "17 day diet" and the "creamy pasta, beer, tacos, and nachos vacation diet" (yeah, it's a thing). This world is pretty perfect, if you ask me. Almond butter, whole grains, veggies, nuts, fruits galore, dark chocolate, avocados, and pb&j-esque smoothies live here. How can that be a bad place? And... so do these chicken souvlaki pita pockets. The chicken is marinated in Greek-inspired flavors then grilled. It turned out SO flavorful and tender and delicious. Ryan even said it was one of his favorite chicken dishes I've ever made! And I've made A LOT OF CHICKEN. The chicken souvlaki is served in wheat pita pockets and topped with homemade tzatziki sauce -- one of my favorite condiments ever. 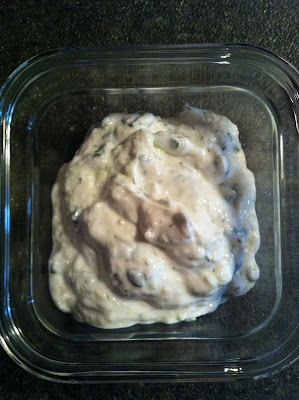 I first showed you my tzatziki sauce atop lamb burgers -- I LOOOVE this refreshing, creamy cucumber sauce. Then, we add feta cheese, raw red onions, sliced tomatoes and cucumbers, and a squeeze of lemon -- mm! These chicken pita pockets make for a perfect quick-and-easy light summer meal. Make the marinade and tzatziki the night before, then when it's dinner time just throw the chicken on the grill while you assemble the fixin's. The night before, prepare your marinade and your tzatziki. For the marinade, you need olive oil, a lemon, garlic powder, dill, oregano, red pepper flakes, salt, and pepper. Mix in a bowl. 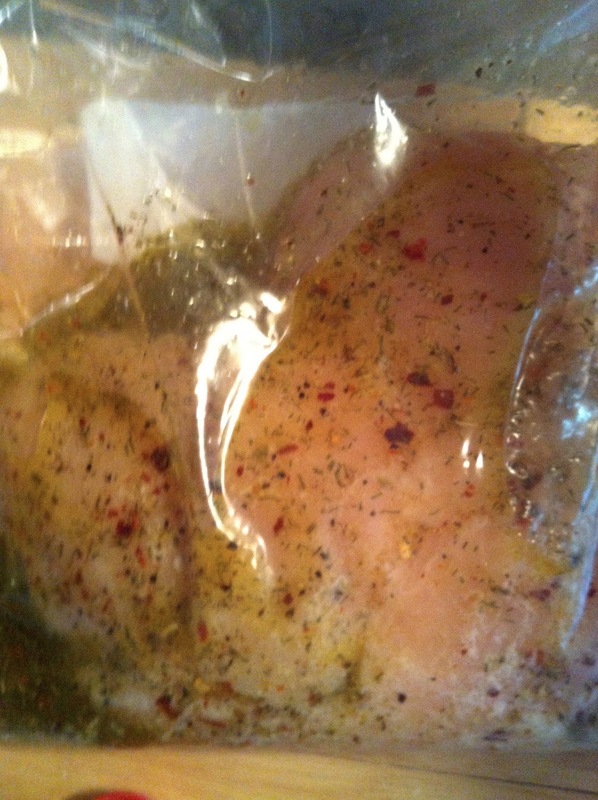 Place 3 or 4 raw chicken breasts in a ziploc bag and pour in the marinade. Put in the fridge overnight. Then, make your tzatziki. Combine grated cucumber (squeezed dry in paper towels -- see my photo step-by-step instructions here), chopped fresh mint leaves, garlic, and dill. This is very simple version of tzatziki sauce - I just love the natural cucumber flavor and prefer not to add in much else. You could also include some vinegar or lemon juice for some extra acidity if you'd like though. Combine and refrigerate overnight along with the marinating chicken. When you're ready to grill, heat a grill pan or outdoor grill over medium-high heat. Let get hot, then add chicken. 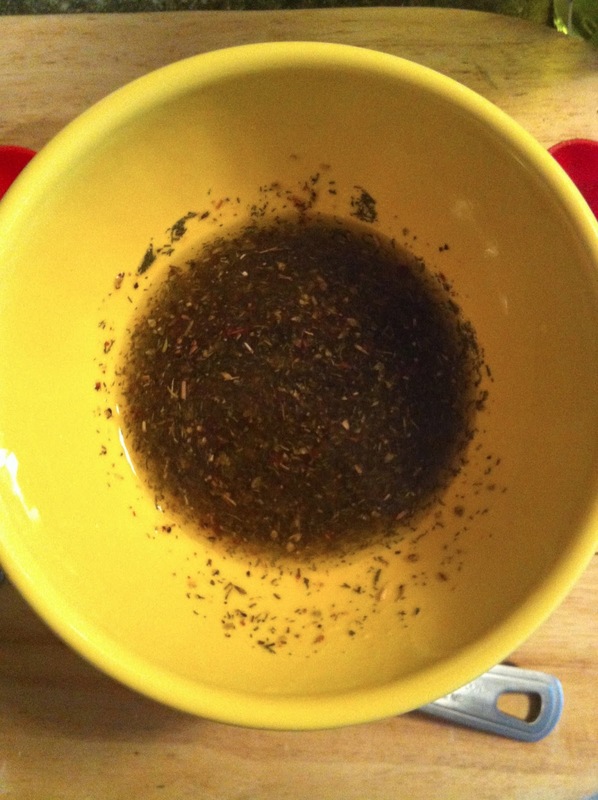 Brush on extra marinade. Cook for 5-6 minutes per side, or until cooked through. Place on a plate and tent with foil for at least 8-10 minutes before slicing. Prepare your desired toppings and slice pita pockets open. Once you've let the chicken rest a bit, slice into pieces. Place everything on the table and prepare your pita pockets! 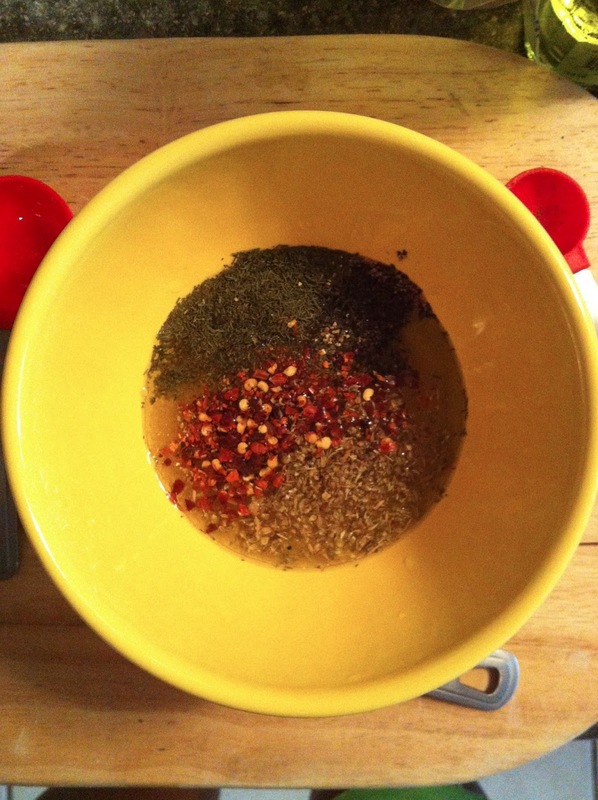 -The night before, prepare your marinade: combine the marinade ingredients (olive oil, lemon, dill, garlic powder, oregano, red pepper, salt and pepper). Place chicken in a ziploc bag or shallow bowl and pour marinade over top. Refrigerate overnight. 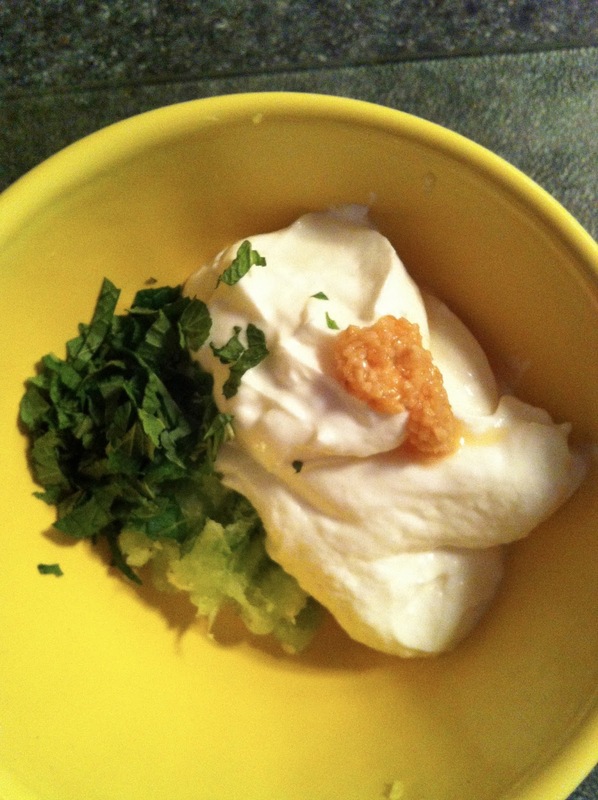 -The night before, also prepare your tzatziki: mix grated cucumber with greek yogurt, mint leaves, garlic, and dill. Refrigerate overnight. 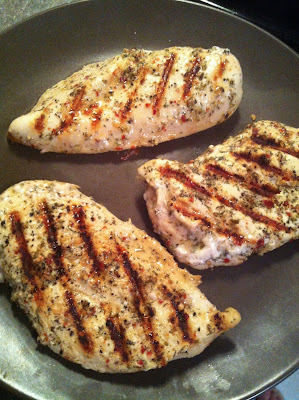 -When ready to cook, heat grill pan or outdoor grill over medium high heat. Let get hot. Add chicken and brush additional marinade on top of breasts. Cook for 5-6 minutes/side, or until browned on the outside and cooked through. Don't overcook! -Add the chicken to a plate and tent with foil for at least 8-10 minutes before slicing. Then, slice into pieces. -Serve chicken along with pita pockets and desired toppings. yummmmy putting this on my menu - your presentation is so pretty!